And enjoyable & thought provoking read! It has some limitations having been published in 2001, as does any references to pop culture, but uses the four TV shows to great effect in posing observations on globalization & localization versus the nation-state regarding the USA. "Thought-provoking" is such a cliche (and especially from me of late) but this book takes a less judgmental examination of globalization than is seen in most academic and faux academic treatments. The author, a retired University of Virginia professor, looks at globalization through the window of its treatment on television programs in the 1960s and then in the 1990s. The 1960s were, of course, a time before the term globalization was coined. At that time there was primarily the term "Americanization." It was assumed in popular culture that the development of a global culture would mean that everyone would become like Americans, and American television entertainments reflected this view. On "Gilligan's Island," a silly half-hour sitcom, a group of Americans are stranded on an uninhabited island but they import their American culture and recreate it on the island, forming a virtual American suburb in the middle of the Pacific Ocean. Occassionally, other people do stumble on the castaways, but before they leave, they are usually converted to Americanism. Similarly, the 1960s science fiction series "Star Trek" unwittingly portrayed the earth of several centuries in the future as Americanized. Even the more diverse crewmembers, from a Russian to an African to the interplanetary Mr. Spock, seemed to be in an ongoing process of assimilation to a slangy, English-speaking American culture that seemed to dominate the Federation of Planets.Fast forward to the 1990s. Professor Cantor analyzes two television series approximately as iconic to that decade as "Gilligan" and "Star Trek" were to the 1960s. But "The Simpsons" and "The X-Files" give us a far different picture of globalization than the earlier shows did. Aside from the fact that globalization came to be a term widely used in the 1990s whereas it was not during the 1960s, it is less apt to mean Americanization in the context of these later television series. For example, Apu, the proprietor of Quicky-Mart in the Simpson's "All-American" city of Springfield, USA, is a practicing Hindu, not entirely keen about assimilating to American culture. He has a shrine to his gods in his store. Every contact between the Simpsons and the world beyond American shores suggests that Americans are as likely to be compelled to assimilate to foreign cultures as foreign cultures are to assimilate to the American. (Indeed, Quicky-Mart's world headquarters are in India! If this seems far fetched, it is a fact that many Americans think that Sony is an American company when in fact it is Japanese. )"The X-Files" gives a darker picture of globalization but it is in surprizing agreement with "The Simpsons" about the fact that cultures are apt to live side by side without assimilation and that accomodation is as often as not required of the dominant culture and not the minority. Cantor looks at several episodes that suggest that alien cultures in the United States maintain their identities and refuse to assimilate. ("The X-Files" concern with aliens from outer space demanding assimilation from earthlings is an even more stark instance of the message that America may be required to submit rather than dominate.) Meanwhile, foreign cultures elsewhere in the world influence the United States as much as or more than they are influenced by America. The optimism of Americanism triumphant that was characteristic of the shows of the 1960s is absent from those of the 1990s.Cantor's thesis runs counter to the usual cant one hears about globalization being equivalent to the dominance of the third world by the first. Instead, he sees globalization as a two-way street where the foreign culture, as often as not, requires the accomodation of the American, and even the minority has its own power that demands respect from the majority. In our contemporary world, where we find the United States in danger of losing its status in the world, Cantor's book seems prescient. Globalization, pop culture, the end of history, and Hegelian dialectic--all of that's wonderfully blended in this fascinating examination of four decades of American television. Cantor, an English professor at Virginia University, aptly examines television scripts as he would literary texts, a move that lends itself well to the four major TV series he covers (Gilligan, Star Trek, The Simpsons, and The X-Files). Rejecting a purely Cultural Studies approach ("Cultural Studies provides a variation on Neitzsche's formulation of Kant's joke--scholars writing about the interests of the common man in terms the common man could never understand..."), Cantor respects the heterogeneity of the material he covers, allowing the text to communicate what is actually there in his discussion of TV's morphing views on U.S. globalization. He acknowledges the methodological difficulties of of analyzing TV series--which feature dozens of episodes multiplied by the years a series runs--as one holistic text, yet argues vehemently (as well as humorously and convincingly) that it can be done, and done well. As he notes in his methods section: "In short, as nervous as I am about transposing interpretive techniques that I learned in studying literature to the analysis of television programs, I think that the situation in the newer medium is not without legitimate analogies to what has prevailed in literary history." Beyond all thematic content is the underlying beauty, humor, and wit of Cantor's writing. Cantor writers with an ironical, self-depreciating style unusual for a man of such academic prowess, and clearly enjoys his material. 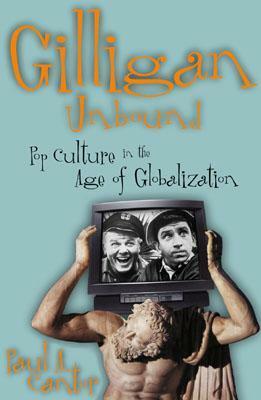 He dedicates the book to his VCR (Gilligan Unbound was published in early 2001), and it makes sense, as Cantor clearly has viewed every series he writes about many times. Throughout, Cantor logically deconstructs singular episodes in a total analysis of their views of identity, alienation, class and gender, while consistently returning to his overarching theme of globalization and its effects via TV on the American viewer (and vice-versa). The parts always return to the whole, and do so in a way that leaves you hoping Cantor keeps writing well into his 8th decade. Good explications of the globalization aspects of Gilligan's Island, Star Trek, The Simpsons and The X-Files....but can't help but bring left and right politics into it (despite his initial declaration to avoid politics at that level). It's good that he laid out his bias, but at the same time his biases simplified his view of Hollywood. Mr. Cantor lectured a Literature of British Empire class I took as a UVA undergrad in the 90's. I wish he'd taught my Popular Fiction class instead. (I was compelled to take that class to fulfill my "nontraditional" requirement.) I'll be interested to read this book.